It’s never been easier to get your small business into e-commerce. It used to be that if you wanted to sell merchandise on the Web, you had to buy a domain name, find and pay a web host, find and pay someone to develop an e-commerce website for you, and then, if those services weren’t included with your e-commerce “package”, set up accounts with various providers so you could have secure payment processing on your website. There are so many easier ways to get an e-commerce website for your small business now. What follows is a list of good turnkey e-commerce packages for small businesses that want to sell online but don’t necessarily have the technical expertise to create their own websites, catalogs, and shopping carts. For this reason, I have not included any open source e-commerce solutions here. There are many available, and if you are a tech-savvy entrepreneur, you may want to seek one of them out. These companies will handle every step that you need to do to get your products online and sell them. Shopify is one of those all-in-one packages that anyone can use to set up and operate an online store. You can either use one of their templates or a custom-designed theme for your e-commerce site, and everything is included from getting a domain name through a secure shopping cart so you can accept credit cards and PayPal payments. If you also have a brick and mortar store as well as a website, Shopify offers an iPad point of sale system that you can use which will automatically sync all your products, inventory, orders, and customers between your e-commerce site and your retail store. And take note, Canadians – this is a Canadian company, so of course, you will be able to charge customers Canadian sales taxes like GST, PST, QST, and HST! Fees: A Basic plan cost $29 a month with an online credit card rate of 2.9% plus 30 cents online, and there is no product limit. There are no set up fees. Bigcommerce is a true turnkey e-commerce solution. Features such as SEO, marketing tools, the ability to provide coupons and product reviews on your website are all included. But my favorite feature about Bigcommerce is that it integrates so quickly with so many other applications, including QuickBooks, MailChimp, Facebook, and Constant Contact. Fees: A Silver Plan, the most basic choice, is $34.95 a month ($31.45 a month with a yearly subscription). Plus Bigcommerce Payments, if you choose to use it, has a 2.9% USD transaction rate and a 30 cents per transaction charge. Note that if you are not in the States, you won’t be able to use Bigcommerce Payments but will have to set up credit card processing separately. This is another all-in-one e-commerce solution that will provide you with everything you need for selling online, including a shopping cart and credit card processing services. One of Volusion’s outstanding features is the ability to sell on Facebook easily, eBay and Amazon, all integrated with your Volusion store. Fees: The most inexpensive plan, the Mini, is $15 a month USD with a 100 product limit and no transaction fees. Magento’s almost all-in-one e-commerce package includes a lot of impressive features. Features include layered browsing for your product catalog which gives customers the ability to filter search, the ability to completely customize your online store’s design if you have the skills and still produce a good looking site if you don’t, and features to drive conversions such as having product comparison and wish lists available to customers. The one potential downside is that Magento Go is not a turnkey solution; plans don’t include credit card processing. You have to sign up with a credit card processing service separately and then add that service to your account. It’s not that difficult, but it will add costs. Fees: The basic Get Going plan costs $15 a month USD with a 100 product limit and no transaction fees. Plus the cost of credit card processing (see above). This turnkey solution includes a domain name, business email, and website with a customizable shopping cart, credit card/Paypal processing and tracking and analytics tools. Fees: A Merchant Starter package is $10.95 UDS a month for the first year ($33.95 a month after that) with a transaction fee of 1.5%. There is no setup fee as of the time of writing. Yola takes a module rather than an all-in-one approach to small business websites; There are different levels of website packages that you purchase and use to build your site and then if you like, you can add an online store to your package for $10 a month. The store includes the ability to manage inventory, accept credit cards, track orders and sell on your website and through Facebook. Fees: The Bronze package, with a custom domain, an unlimited number of pages and unlimited bandwidth are $4.17 a month with a yearly subscription, so with the additional $10 for an online store, you could be selling online for $14.17 a month. You’re probably already familiar with eBay’s auction capabilities. But did you know that eBay also offers sellers their own online storefronts? Besides the home page for your store and unlimited product pages, the basic package includes management and promotion tools such as customized e-newsletters and promotional emails and tracking tools. Note that you won’t have your own URL with an eBay store, but instead will have a directory URL such as www.stores.ebay.com/yourstorename. Fees: The Basic is the most inexpensive plan; it offers up to 150 free listings per month for CAD 15.95 a month with a yearly subscription. People tend to think of Etsy as a marketplace just for artists and crafters, but it’s not; as of 2013, vintage items, craft supplies, and “unique factory-manufactured items” can all be sold there too. 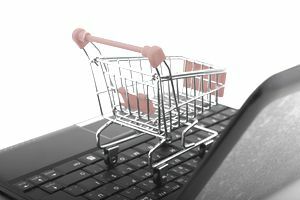 It’s not an all-in-one turnkey e-commerce solution like the others on this page, but if what you’re selling qualifies, it can be an inexpensive way to get selling online. Fees: It costs 20 cents USD to list an item, and Etsy collects a 3.5% fee on the sale price of whatever you sell. There are no membership fees. Besides the fact that all the e-commerce solutions above are relatively inexpensive and designed to be user-friendly to small business owners, they all also offer free trials of two weeks to a month. So no more excuses; pick one of the companies above, dip your toes into e-commerce, and start selling online!